1. In a large saucepan over medium-high heat, heat 1 tablespoon olive oil and 2 tablespoons butter. Add the fennel, onion, celery, garlic, anise seeds, if using, and fennel seeds and cook, stirring occasionally, until the vegetables begin to soften, 7 to 9 minutes. 2. Stir in the potatoes and the remaining 1 tablespoon butter and cook until the potatoes begin to brown and stick to the bottom of the pan, about 5 minutes. Slowly pour in the broth, stirring and scraping any browned bits from the bottom of the pan. Bring the mixture to a boil, reduce the heat to medium-low, and cook until the potatoes are softened, 10 to 15 minutes. 3. Stir in the cream, cover, and continue to simmer until the vegetables are completely softened, about 5 minutes more. 4. Using an immersion blender (or using a standard blender and letting the mixture cool and blending it in batches), puree the soup until smooth. Season to taste with salt. If the soup seems too thick, add a little additional broth to thin. 5. 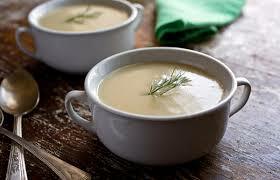 Serve the soup hot with a dribble of olive oil and a sprinkle of salt and black pepper.